All Schumann's quartets are, to a degree, neglected. You just happen to have the Zehetmair cd which does 1 and 3. I don't think there's anything to it. If you want all three on single disc Eroica on HM is pretty good, though I'm not too keen on their 3rd. Did some listening and actually the plodding 3rd I had in mind isn't Eroica but Quatuor Ysaye (on Aeon) which I almost completely forgot having. They also couple all three quartets on same disc, but I can find anything particularly interesting about their takes. Definitely forgettable. Yes, I think you're right. Columbia LPs should be studio recordings. His chamber works are relatively inspired but his use of form is pretty uninteresting, often downright pedestrian. They are not bad by any means but they are not as good as his piano works or his lieder. That's the recording I have, since I haven't heard any others (excepting the bland Cherubini Q) I have no point of reference. Excepting the overpriced Juilliard Q recording I don't think there are any stellar ensembles on an in print cd that make it worth exploring other recordings. 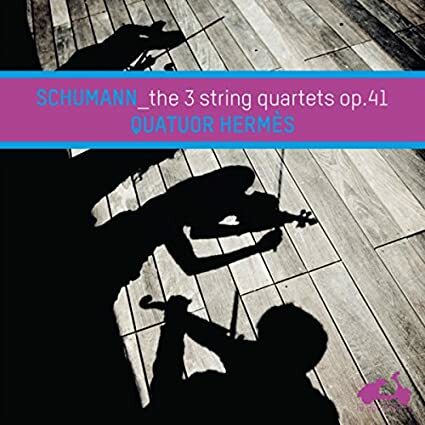 Looks like I've found my go-to recording of Schumann's quartets. It's not like the other three versions I've heard this year were bad, it's just that this has everything. Playing is well-nigh flawless. Ensemble is impeccable. Intonation, too. Fast and vibrant passages are fast and fast and vibrant, slow passages perfectly paced and lovely. The music is played in a romantic but not overdone manner. Vibrato is used the way I like it. And sound is basically SOTA. I hope to hear more from the Quatour Hermes.